Wondering if accusations against Assad for human rights & war crimes would be taken more seriously by activists if his wife were not so fashionable & they were not so Western in style? Say, for example, if he looked like Idi Amin (charged with the same atrocities), dressed in a military uniform, or if he dressed in traditional garb like the monarchs of Bahrain & Saudi Arabia? Wondering also if the glorification of Putin would withstand scrutiny of his political practices in Russia? Say, for example, his 2014 law making homophobia state policy which incited street violence against gays & led to raids, prosecutions & incarceration for being gay? Or maybe his treatment of immigrant workers who built the stadia for the 2014 Sochi Olympic games? After the stadia were built, his regime launched raids on them, incarcerated them under abusive conditions in overcrowded or outdoor cells without food or medical care, & then deported them. Or perhaps his use of forced immigrant labor on the Sochi stadia where authorities confiscated passports, denied required work permits, cheated workers out of wages (an estimated 50,000 workers)? Is all that just demonizing, Western propaganda? The struggles today against racist oppression in all its malignant forms–including the war on Black youth in the US, expropriation & cultural destruction of indigenous peoples on every continent, caste oppression In India, anti-immigration campaigns–are among the most important struggles historically. Racism of such violence & mayhem has not always existed & it can be ended. But not without titanic & committed struggles against those who profit so lavishly from it. Racism is integral to modern capitalism which could not function without such violent & ignominious inequalities. Racism is integral to war & to the oppression of women. The pity is, it’s all a big fat ugly stupid lie that some human beings are born superior & some inferior & it’s a lie humanity can no longer live with because it has caused & continues to cause genocides & unspeakable crimes against millions of people. 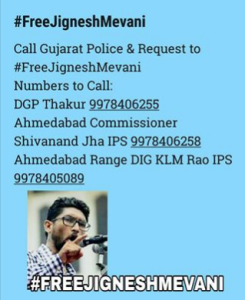 Jignesh Mevani is a young Dalit activist in the Indian state of Gujarat leading the resurgence of the anti-caste movement in India. Yesterday, on returning from a speaking engagement in another state, he was arrested by Indian police & his whereabouts are still unknown. His arrest & that of Khurram Parvez, the Kashmiri human rights leader, are of a piece with prime minister Modi’s political agenda for India which includes maintaining caste oppression, Kashmir as a colony, pogroms against Muslims, & the entire panoply of neoliberal capitalist economic inequalities & plunder. Their fate as leaders against racist oppression is of consequence to all humanity who care about human rights & who detest the squalid concepts of racism. Those of you who live in India can take immediate action by calling the numbers listed to protest. 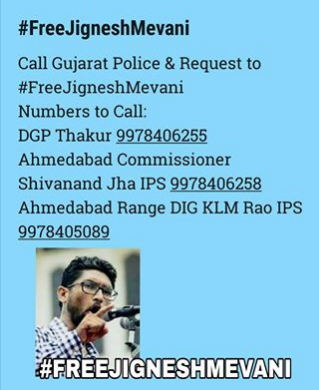 Dalit & human rights activists in India are preparing ways we can all participate in Jignesh Mevani’s defense if that becomes necessary. 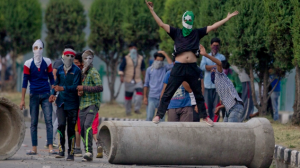 Indian army has arrested thousands of Kashmiri protesters: where are they? The arrest of Khurram Parvez with no legal basis brings up the issue of all Kashmiris arrested in protests since July 9th. It’s likely that in the turmoil of the military siege many have been arrested & are not yet accounted for. On August 8th, only four weeks into the ten week siege, Indian military officials admitted to arresting 1,300 youth. Many were picked up in nighttime raids for participating in protests. How many more have been arrested since then? Where are they? Have they been charged with a crime & provided legal counsel? Or are they buried in the gulag to be held indefinitely without charge under administrative detention–as is used so profligately against Palestinian youth by Israeli military officials? This is a matter of grave concern since India, like Israel, employs systematic torture of its political detainees, including beatings, electric shock, & other methods too gruesome to describe. Investigating illegal arrests, torture, disappearances is the kind of political work Khurram Parvez & the JKCCS engage in. He is now being held under administrative detention so defending him is part of defending the other activists from being lost forever in the gulag or ending up disappeared in mass graves. The defense campaign for Khurram Parvez has begun. According to the Jammu Kashmir Coalition of Civil Society (JKCCS), Khurram Parvez has now been in police custody for 16 hours without charge, certainly without having committed a crime, & is being denied access to lawyers. Human rights organizations & activists around the world echo the alarm of JKCCS & are sending messages of concern. Khurram is a leading human rights activist in Kashmir. He is program coordinator of JKCCS which has brilliantly documented human rights crimes by the occupying army, particularly disappearances & mass graves for thousands of Kashmiris. He is also chairperson of the Asian Federation Against involuntary Disappearances (AFAD). For India to arrest him so boldly without cause must be condemned & opposed. The Intention in arresting such a prominent & uncompromising human rights figure is certainly to send a message to Kashmiri activists that no one is beyond the scope of their gulag justice. If he is not released soon, there will certainly be an international campaign demanding his immediate, unconditional release. The linked article is the press statement by JKCCS on Khurram’s arrest. Please circulate it widely. You meet a lot of different people on social media. Some are nuts. Some are dangerous. You meet a lot of different people on social media. There’s a lot of crazy-pants stuff one can mostly tolerate (not always) but the racists & nationalists are outright scary. They just want to kill people, especially if you’re Black or Muslim. Some remind me of the rightwing guys I used to work with who hated my politics & were always trying to threaten me. I could write a book on the poses they strike to intimidate. A favorite is sticking out their pot bellies, trying to make them look like barrel chests, & looking down their noses at you with a Clint Eastwood sneer. You have to try not to laugh & you can’t look scared. And sometimes when you answer them, you poke them in the belly to make sure they think you might be deranged & do them in. They were afraid of Black guys even though they hated them cause physical size matters to small-minded bigot-brains & in that regard the men had little difference. Since I’m only 5’2″ they thought it would be a walk in the park to make me cower in fear. But even little women, especially pissed off ones, can back them off if they’re aren’t carrying clubs cause a lot of them are weasels at heart, afraid of their own shadows & who think everyone’s out to get them. Threatening them with bodily harm worked (“I have seven brothers & they’ll break every bone in your body…”). Threatening them with legal action worked better. Both were empty threats but they didn’t know that. Smarts is seldom their strong point. Hatred is. Got called a lot of names & accused of unseemly sexual acts with Blacks for pay. But you don’t blush & you certainly don’t explain; you come out slugging even if you’re only packing empty threats. Attitude counts. It was many years of hard-scrabble training for social media. So when someone on Twitter or Facebook calls me a jihadist or “a habitual placard holder from Minnesota” it’s just chump stuff. If I see their walls are filled with irrational venom & hatred toward Blacks or Muslims, I just block their ugly asses & all the scatological & simian images, bloody scenes involving animal sacrifice & child brides. It’s like finding yourself in a psycho house of horrors & it’s pogrom mentality. They need to be smartened up but words aren’t meaningful to them. Power is.